When you go to save a header you've created on a certain page, click the arrow next to the Save button to pull up different options. You can save this header to all the pages of your site, to only the page you've been working on, or to pages that you select. If you go with the "Only selected pages" option, you'll see a dialog box where you can select the pages to which you want to save this header. 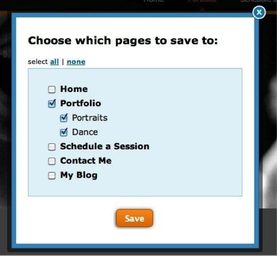 All you have to do is select the pages you want and click Save. The exact header you've created will then show up on each of those pages. Next up, learn how to Create an Image Slideshow.